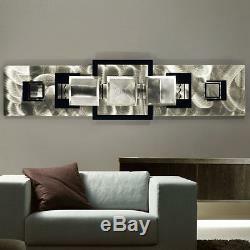 Large Modern Abstract Aluminum Metal Wall Art Decor Silver/Black "Medallion". 48" x 12" x 2. High Grade rigid Aluminum plate. Fabrication Methods & &###xA0;&###xA0;Features. The dynamic patterns that appear in this work of art are hand-textured into the aluminum. The highly-reflective qualities are enhanced when exhibited under good track lighting or spot lighting, creating intense depth and highlights that come alive with movement as you view the artwork from different angles. All sculptures and wall art are photographed under vibrant light sources. All pieces are limited editions based on the original piece. Q: &###xA0;When might I expect my artwork to arrive? Installation Q: &###xA0;Do these pieces hang separately or do they hang as one piece together? A: &###xA0;All of the multi panel artwork is hung individually. Each panel is hung with a screw or nail. We provide simple instructions, pre-mounted brackets, and tools to hang your piece. Installation is fast and easy and only requires approximately 5 minutes. Q: &###xA0;Can I hang this artwork outdoors? A: &###xA0;Painted wall sculptures are suggested to mount indoors or under cover from the elements. All free stand sculptures are intended for indoor and outdoor use. The brushed aluminum will not rust or corrode. Extreme cold and mild salt air will not effect the sculpture. Q: &###xA0;Can I hang these pieces vertically? A: &###xA0;Yes, these sculptures can be hung in any direction you like. Q: &###xA0;How do I mount or attached this art to the wall? A: &###xA0;Jon Allen Metal Wall Sculptures are designed to appear floating off the wall. A single bracket mounted to the back of the artwork provides a simple installation of a single nail or screw. Q: &###xA0;Are the edges of the artwork sharp? Q: &###xA0;What is the actual size of the art? A: &###xA0;All of the artwork is measured to include any recommended gaps. The size stated in the listing is the "footprint" of the artwork. These are the dimensions you should allocate to place the artwork in. Please review the listing, the size should be located in the description. As for the Free Standing Sculptures, the height includes the base. Q: &###xA0;What is the weight of this artwork? A: &###xA0;The wall mounted artwork typically weighs between 10 and 14 lbs depending on the number of panels. Freestanding sculptures range between 15 and 20 lbs relative to its height. Lighting Q: &###xA0;What kind of lighting should I use on my artwork? A: &###xA0;Like most artwork, overhead recessed or track-lighting is the very best, to display the metal art. "The greater the light source, the greater the movement and conversation becomes". Q: &###xA0;How do I return an item? A: &###xA0;Contact Statements2000 and we will set up the return for you. Q: &###xA0;Why collect Statements2000 artwork? A &###xA0;There are many reasons. All Statements2000's breathtaking designs and texturing are hand-crafted by internationally-acclaimed metal sculptor, Jon Allen. Jon Allen's Statements2000 fine art is displayed in more than 200 galleries in the United States alone, and has recently showcased worldwide. All artwork is signed, dated, and certified, with a Certificate of Authenticity. Be sure to check the FAQ's above before sending questions, as they may already be answered. Sculptor, Jon Allen, developed his passion for structural minimalism at an early age. His exposure to famous architecture, museums, and galleries around the world, has provided influence and inspiration for his design aesthetic. A graduate of the Ft. Lauderdale Art Institute of Design, Jon Allen built on the core foundations of materials and industrial processes; mastering the fusion and fluidity of geo-organic shapes with a solid contemporary edge. Through his composition, Jon Allen captures his audience with an explosive collision of spellbinding pattern complexity and modern simplicity. An accomplished artist, who possesses a keen eye for harmonizing order, balance, and elegance, his accolades include memberships in juried art communities, guilds, and associations, and has placed artwork in over 200 galleries, in the United States alone. Through his company, Statements2000, Jon Allen continues to exhibit his award-winning collections domestically, and has expanded to the international scene. Having perfected various design techniques, Jon Allen applies multi-dynamic compositions to highly reflective metals, to create the signature "WOW" factor. His limited series of original, fine art sculptures are displayed worldwide, from the corporate halls of Manhattan, NY, to the exclusive estates of Manchester, UK. Jon's inspiration is at the intersection of architecture and art. He loves clean lines and modern, contemporary art. His passion&###xA0;initially lead him to hand-making highly structural, architectural jewelry. He and his wife, with two young kids in tow, participated in art shows across the country. The reputation and demand grew steadily; galleries all over were clamoring for Jon? Even at prim, highly-revered juried art shows, lines would form around Jon? Other exhibitors would even complain on&###xA0;o. Ccasion, but there was no recourse; there was simply nothing could diminish the connection between the people and Jon? That connection would prove to be enduring. Today, Jon is revered as an innovator in the metal art realm. His work is well respected, often imitated but never replicated. His command over his chosen medium, metal, is unparalleled. S studio, you would guess you were seeing the work of no fewer than ten artists, each of whom had dedicated an entire lifetime to&##xA0. How could one person so masterfully&##xA0. &###xA0;an ethereal painting of an exotic jellyfish with electric tentacles that looks as though it were painted on glass&###xA0; and &###xA0;an abstract portrait that is evocative of Picasso? Surely not the same artist who just completed an art deco wall sculpture or&##xA0. But you would guess wrong. Everyone at Jon's studio loves the stunning photos of Jon's work that his collectors send and we proudly share those images on our website &###xA0;as well as on our Instagram and other social media outlets. Jon's work has been seen in major motion pictures like. And has also been featured on popular television series like. Statements2000 and jonallenmetalart&###xA0;are the only two official&##xA0. Purchasing from us ensures you're receiving authentic, brand new, signed artwork that includes a certificate of authenticity. Since Jon is the original and premiere metal artist of the internet, his work is often copied. Many competitors even use Jon's name to try to fool unsuspecting shoppers. Sadly, their work is sub-par and is very frequently printed in China. When you do, you are supporting a truly independent artist. We do not accept checks or wire transfers. Perhaps you've moved or maybe you intend to have the artwork delivered to your office instead of your home. Checking your default information takes just a moment and can save you time and aggravation. However, getting the artwork to its destination is our top priority. International rates may or may not include. It is very helpful to retain the damaged packaging and take photos of the damaged artwork so we can file a damaged claim with the carrier. We will work with you to make sure you have as fast and as hassle free of a resolution as possible. Please use original packaging material or equivalent to ensure the artwork arrives back in the condition you received it. Sign Up To Our Newsletter. This listing is currently undergoing maintenance, we apologise for any inconvenience caused. 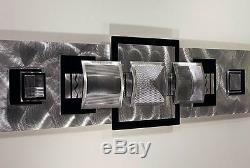 The item "Statements2000 Modern Metal Wall Art Sculpture Silver Black Jon Allen Medallion" is in sale since Thursday, November 21, 2013.